You got customers in the door. Maybe it was your brand’s great reputation, or maybe it was that snazzy visual merchandising in your store window. But, now that customers are here, how can you convince them to buy? By continuing that savvy visual merchandising throughout. Even if you don’t think you have an “artistic eye,” these must-know techniques will help you create intriguing displays that encourage shoppers to stay longer and buy more. Sight. Smart visual merchandising draws the eye, inspiring a closer, longer look. That tempts interaction. Touch. Studies show that customers who pick up items to examine or try are more likely to buy. Sound. “Mood” music isn’t a joke, you can pep up shoppers or calm them into comfortable browsing mode. Smell. Aromas provide our most powerful memories. Don’t sell anything delightfully fragrant? Use subtle seasonal scents or something universally appealing like vanilla. Taste. Shoppers will make a beeline for samples, but if you don’t sell edibles or beverages, consider offering coffee, tea, and cookies that appeal to their sense of taste and encourage longer browsing. Psychology — our emotional response to what our senses take in — plays a powerful role in purchasing. Customers want facts about products, but even more, they want to know how that purchase will make them feel. Will they be prettier, more relaxed, more comfortable, a more popular host, a more accomplished cook? Will their home or yard or office look and/or function better? Speak to them with color because science has proven that different colors inspire specific emotions. This is the underlying point of visual merchandising. But it takes more than piling items on shelves to entice customers. Use the Rule of Three, for two reasons. The human eye prefers asymmetry — three of something rather than two or four. That unevenness also draws the eye from one item to another. This rule applies to height variations within displays and to displays themselves around your store. Group products rather than displaying just one thing. You know how a website offers “other items you might like” when you're shopping online? In-store groupings send the same message. You can group by color, type, size, etc. Or display related products that tell a lifestyle story — how you can use or wear the items together. Think furniture set-ups, table settings, coffee cups and packages of coffee, mannequins that show off entire outfits. Groupings encourage impulse buying. Put your hot, new merchandise near the entrance to instantly grab attention. Place it toward the right, because that’s the direction most customers look first. Customers are used to shopping online and using digital devices to live their lives. They expect the same sort of tech-enhanced experience when they shop in person. New technologies offer increasingly engaging ways to deliver that in-store experience, from digital signage and displays to interactive touch-screens that let customers browse or customize products to zap-and-go payment. Go bold with wearable technology or beacons that reach out to individual shoppers. It’s not easy to keep up with evolving technology, but if you make an effort to incorporate relevant new options, your customers will take notice. They will appreciate the convenience and personalization, and mark your brand as an innovator. Signage is also a visual tool that directs traffic, catches the eye, and informs customers. Keep text short and gold. Or use graphics to deliver messages even faster than words. How likely are you to shop in a store where you’ve memorized all the displays? The same old same old shouts, “Nothing new here!” Might as well move on, right? Change up your displays regularly and move products around your store to showcase different items. Even the most creative retailer needs inspiration. 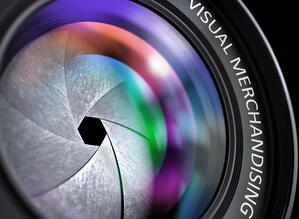 Find your visual merchandise muse in online articles, on Pinterest, in other stores. When you see a display you love, ask yourself why. When you appeal to all five senses plus your customer’s emotional “sixth sense,” use signage to help guide them and technology to personalize their experience, you will accomplish the ultimate goal of visual merchandising: increased sales.